Cavalor FreeBute Pro has been developed specifically to prevent inflammation in the joints & muscles and guarantees greater mobility. This competition safe paste is ideal for horses that need to delivery top performances at the highest level. 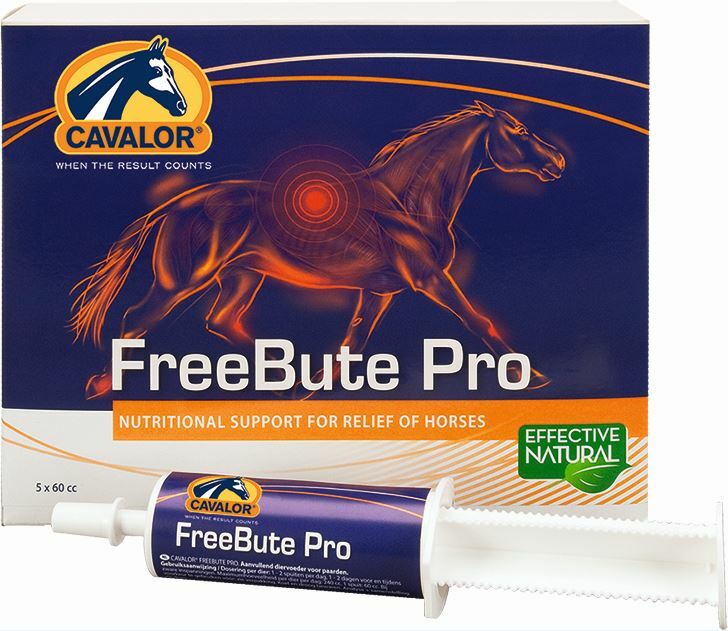 Cavalor FreeBute Pro is a handy paste that contains a natural, herbal blend of amino acids & vitamins to support muscle function & provide relief during the recovery period. It can be given to sport horses, for additional joint & muscle support during a competition, or it can be given long term to horses with lameness issues. It can also be combined safely with Cavalor Arti Matrix or Cavalor Muscle Fit. Cavalor FreeBute Pro does not contain any FEI prohibited substances and Cavalor guarantees complete traceability of all raw materials. Every batch is sent to the Cavalor laboratory to ensure they are of the highest quality and meet safety standards. To maximise performance, give 1/2-1 syringe the evening before the competition & then 1/2-1 syringe the morning of the competition.